While not as overtly peat-heavy as an Islay malt, Talisker’s peat provides a background of earthiness that matches its rocky flavors. As this is one of the more complex of whiskies, it may take some getting used to. Once you can appreciate it, though, nothing beats Talisker for relief at the end of a hard day. Nose: Sea air, seaweed, brine, a hint of blood orange. Palate: Hard and rocky, evoking sea cliffs and tumbling waterfalls. Rock candy. There is a shadow of heather in the middle notes, and a solid background of peat (but not smoke). Very earthy and mineral. The body is firm, a touch oily, and a little creamy, but the mineral flavors contrast starkly. Intricate, complex, evolving. Finish: Long, warming and citrusy, with previously hidden notes of marshmallow, moss, chalk, lemon, white pepper, and orange peel. Adding a dash of water opened up some of the warmer floral scents, but seems to mask the coastal notes. I prefer it neat. 007 wouldn’t have added any water, why should I? Talisker is a dram to brood over. Like Ian Fleming’s Bond, it is edgy, steely, and mysterious. It punches you in the face and then lulls you into submission. There is nothing else quite like it. Talisker is located on the lonely Isle of Skye, off the western coast of the Scottish Highlands (included in the “Island” region by owner Diageo). The population there still speaks Scots Gaelic, and Talisker is the only whisky distillery on the island. But oh, what whisky. Poet Robert Louis Stevenson identified this distillery’s product as a category of its own, and once referred to it as “the king of drinks.” He wasn’t alone. In the James Bond movies, 007 and M can be seen drinking Talisker. Like Bond, Talisker is rough by nature – rocky and influenced by the sea by which it is made. The spring water flows over peat and has a very high mineral content. Excellent tasting note of an excellent single malt! Indeed, my friend! I love the Talisker 10! First time I’ve ever commented on a site. I have bought several bottles based on your tasting notes. Thank you for your insight. I finally found a bottle of this stuff and am “brooding” over it for the first time as I write. It definitely warrants my first comment. I may be crazy, but I get margarita from it. Salt, lime, some sweet, and I swear, tequila. I don’t know how I get that, but this is truly a magic drop. Kevin, thanks for the comment! 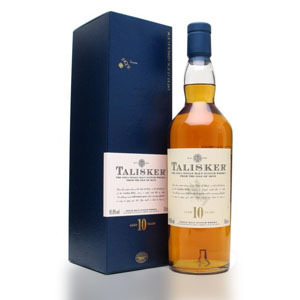 Cool tasting note – Talisker definitely is known for its minerality – that rocky/salty quality. I can see how a little inherent sweetness (from the cask wood) and a bit of acidity could evoke margaritas! I’ll have to look for that when I have my next dram of Talisker. Cheers! I’m pretty new to single malt scotch and have relied greatly on the reviews here to guide my initial investments and tastings. I swallowed hard and bought the Talisker 10 last night, and was in love at the first nose and sip! A great single malt that will probably be my new “measuring stick” whisky. Thanks for all the very helpful reviews! Thanks Kevin! Glad you enjoyed the Talisker 10 – a real gem that’s still one of my favorite whiskies. Talisker 10 to my palate is always engaging and intriguing. Grabs you by the lapels and stays in your face. It demands, gets and keeps your full attention. Between this and a Highland Park 18 most of my bases are covered. Thanks for the excellent review! Similarly to KevinO, I am a relative n00b in the single malt world and have greatly benefited from your blog. My local liquor store had a sale on Talisker recently, and remembering this review, I decided to pick up a bottle. I am VERY satisfied with the purchase! I think this is a front-runner for my favorite. Thanks for your reccomendations! Just got another He-Man pour from my new favorite bartender. Talisker 10 it is. Having already taken my first sip I must say bacon on a field greens salad. Now back to the nose… I agree with Kevin. I’m getting heavy agave. I’m getting a little of that citrus before adding water. Something a little earthy. Grass root. Man! That is quite a burn. Time to add a few drops of water. Getting a little wet sand and seaside loveliness on the nose now. Pepper of some sort as well (maybe white). Wood has invaded my palate like a welcome rescuer. Can’t place the wood but it has recently been polished. Overall? Fantastic! It’s been two minutes since my last taste and I’m enjoying peat and stale water. Love this drink! NOOB! Keep up the good work. You’re the best. Your opening paragraph hits the nail dead on! I work long hours on the weekends, and as you aptly put it – there are many times I begin to “crave” a hearty dram of the Talisker 10 yr while on my long drive home. I can honestly say that I do not have that same craving for any other whisky, and it never disappoints! I’ve had two bottles of the 10 yer and 1 of the distillers edition (duty free holiday bonus). For me the 10yr was a very decent drop for the price, however the distillers edition was in another league an absolute corker. Personally for the same price as the 10yr I’d rather a bottle of Ardbeg which has many more dimensions,but thats just me. Just a spectacular dram! The best under $100 (can funds) I have ever tried. Anything else you may suggest in the same price range that is at this level of brilliance? Looking to expand my bar selections beyond this one and add variety. Thanks! Rowan, glad you enjoyed Talisker! You will probably also enjoy Lagavulin 16, which is a bit peatier, but just as high quality. If you want to branch out from peated malts, you could try something sherried (GlenDronach 12, Aberlour abunadh, Glenmorangie Lasanta), or something aged in ex-bourbon casks (Oban 14, The Balvenie Single-Barrel 15), or something really sweet (Glenmorangie Nectar D’Or 12 year, aged in ex-sauternes casks). Check the “Top Scotches” section on the right bar for more. The last bottle I had of this tasted like PEAT PEAT and MORE PEAT – what a shame. Seems that more and more distilleries are fall pray to the masses and their juvenile lust for the almight PEAT. Even my most recent bottles of Dalwhinnie and Clynelish tasted like nothing but PEAT. I thought, based on your previous comment on The Dalmore 12 review, that “the masses” want sherry and port-finished scotch? Your comments are not very coherent. On the other hand, it has been said that the increase in popularity of heavily-peated expressions (Ardbeg, for example) has indeed caused an overall increase in the amount of peat used to produce peated scotch. However, I would be extremely surprised if The Dalwhinnie has upped their peat content (their mash only contains 2.8% peated barley, and their process water – which flows over peat bogs – hasn’t changed). As far as you being “extremely surprised if….” life is full of surprises – I was only moderatel surprised when I tasted all the peat in the Dal & Clyn because the hand writing was on the wall and I was kind of expecting it. I can appreciate your description, however, like most others I’ve read… I think it draws way too much of a wall for the average Scotch-Seeker. I thought I was a Speyside Exclusive Enthusiast until I tried the Talisker 10. It was much softer and warmer than any of the reviews I had read, or the in-store shelf stocker reviews I had the pleasure of. (btw: I contest your view of the Glenfiddich 12, to give it an NR while giving the ‘Livet a MT burns the back of my throat 🙂 GF12 is the Only thing I can drink with (as in along side, not in) my coffee in the morning. I DO however concur with the rest of your GL TBB’s. Not bad, just dull. and thank you for creating this meeting place. Much valuable information here. Thanks for your candid comments – I wish everyone who disagreed with me did it so politely! I very much value differences of opinion in these comments sections, as long as they are presented as yours is – constructively. Some posters, below, could learn from your example. I get a lot of flack for my GF 12 review, but I stick by it… as with all whisky (wine, beer, etc.) reviews, there is bound to be a large subjective element. For me, GL 12 is soft and easily drinkable, GF 12 is harsher and less delicate. I believe my GL 12 review is “Recommended”, not “Must Try”, but I understand that many will differ with my opinion. That’s even more of a reason for readers to go out and try everything they can – whether I liked it or not – to determine their own likes and dislikes. BTW, your term Juvenile Lust for Peat is now a permanent part of my descriptions. An absolute Coup! Didn’t know I thought that until you said it. This is a great dialogue. I don’t know what Talisker 10yr bottlings you’re discussing. The bottling with the packaging pictured in this review is a former bottling recently replaced by a redesign of the box (now with a photo of the Skye seaside) and a different spin on the label. I had a dram of the previous bottling and the new bottling side by side and comment: the new bottling has a strong ex burbon cask influence and a bit smokier whereas the previous bottling the smoke and Peat is much more subtle. However, the Talisker malt recipe is sublimely present in both bottlings. As I’m a bit of a Peat monster and really getting into exclusive ex Burbon cask scotch (like The Balvenie Signature 12) this change is great. But, for the folks that prefer the more subtle smoke influence I can get a disappointment. All I can say is let’s not rule out one of the oldest and greatest malts and see what they have in store for us in future bottlings. Meanwhile the lads of Peat will soak this one up. Hi Jonathan, Thanks for the insightful comment! My original review is of the older bottling. I have not had an opportunity to try the newer release. Interesting find Jonathan…For me personally I’ve found both releases (older blue box used a few plus years ago, and the recent bottlings with the Isle of Skye pic) to be very similar, and both wonderful. I find it hard to rationalize 60 bucks for a 10 year scotch. I will be sure to get this after my recent internal war is done i got 3 choices of single malts and i cant pick one Ardberg 10, Laphroaig 10 or lagavulin 16 decisions, decisions. For some reason, the age on the Talisker bottling is not indicative of its quality. It is far better (quality-wise) than Laphroaig 10, and at least as good as Lagavulin 16 (although different in style). It’s definitely worth $60. I would choose Talisker 10 over any of your options. Though I love those whiskys listed, Talisker is the best. Not half as good as it used to be. Now generic and mass produced and unexciting. Too much caramel drowning the flavour and its signature chili catch seemed to have totally disappeared. My advice is find an old bottling or don’t bother….. Whisky is becoming a victim of its own success. I recently returned from a trip to Scotland. I brought home bottles I can’t get over here, in Virginia at least, one of them being Talisker Port Ruighe. 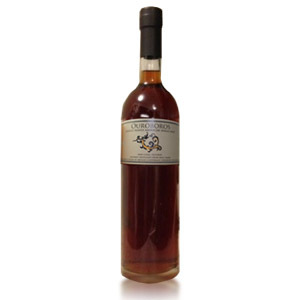 If you aren’t familiar, it’s finished in port casks (I’m a sucker for sherry and port aging/finishing). I thought it would be interesting with Talisker’s unique taste. It’s adds a bit of sweetness to it. I quite like it… Give it a try if you can find it! Cheers! I found a bottle the other day for less than CHF 40, and tried it yesterday with my boyfriend. I’m a newbie when it comes to whisky (due in part to having tasted some horrid cheap blended stuff my father kept), but I could definitively feel the ocean in that one. Needless to say, we both enjoyed it very much! Just had my first Islay—after having only been with Speyside. The Talisker 10 is just amazing. Thanks for the recommendation here. I received Talisker 10 as a birthday present from my son. Usually not a fan of the more northern Whisky, too strong on the peat for my taste. I was pleasantly surprised by it. The nose was strong, but oh what an after glow for my taste buds. Definitely happy with my birthday gift! I’m not really a drinker, but I’m moving so I’ve been going through my fairly nut bar alcohol collection (weird wines, rum, gin and a whole bunch of samples from when my ex-boyfriend went to bartender school). So yesterday I started on the scotch. I had a Dalwhinnie and I wasn’t really sure what to make of it. I didn’t know how to drink it, so I winged it with what I remember seeing on TV (ice and a splash – OK, 3 splashes – of water). That was probably a mistake, but I thought my nostrils would never recover from the first couple of sips. By then end of that drink, I had a definite fit of the giggles and I could really see that this is something I could grow to like. Tonight’s drink was Talisker 10. I’d learnt my lesson, and spent some time smelling the whisky before drinking it and only added a splash of water – still much more than what you recommend but whoa, I’m a novice! By the end of the glass I’m kind of in love… And I’m sad, because that’s it for my whisky. How did I end up with so much rum and so little whisky? Talisker is definitely on the list for my new place. Tequila tomorrow! Sounds like fun! If you’re looking to get a little deeper into scotch, check out my post on Picking your First Single-Malt Scotch, although after Talisker you’re well ahead of the game. After several years of tasting just about every scotch out there, Talisker 10 is still one of my top 10… maybe top 5. You’d probably also enjoy Lagavulin 16. Cheers! I love your site. I’ve been using it since the spring to help me explore my tastes. I’ve been buying, and trying most of 2014, since a visit to Scotland last year. I like to have about 10-12 bottles open for variety, and have my first bottle of Talisker 10 open now. With Canadian prices being incredibly high, this bottle may replace any future purchases of my favourite, Lagavulin 16. The Talisker is like the rough and tumble younger brother of Lagavulin. And about $40 less. Warming, tasty, smoky and buttery. Thanks for reading, Mike! I agree that Talisker 10 is excellent, especially for the price. We can get Lagavulin 16 here in northern California for very good prices, so I tend to alternate between the two (and occasionally a Laphroaig Quarter Cask or Ardbeg Corryvreckan). Cheers! Just got a bottle of Talisker 10 for $1 from a bartender member of my family. After reading these comments I am excited to give it a try! Man, what a deal!!!! I have an online source where I pay $54 a bottle and THAT is a good bargin. I just got a new bottle of this (December 2014) and it is noticeably DARKER than my last few bottles. Anyone know what’s up with that? I’ve yet to open it, so I don’t know if I got a bad bottle or not. I’ve read a lot about quality going south lately. I really hope this one is not suffering. First of all, I want to thank you for all your help and information as I begin my whisky journey. You and your sight have been an invaluable service. I salute you. I have just started, three weeks ago, trying whisky, mostly single malts. I just purchased Taslisker today and I have to say it is my favorite so far. I have only tried three other single malts: Glenmorangie, Glenmorangie Lasanta, and Bowmore 12 Enigma. I have truly enjoyed those three as well. I do find myself liking the more peaty/ smokey flavors. I hope to pick up a Laphroaig soon, along with a Macallan Select Oak. I happen to make my purchases on a military installation, being retired and living in South Korea. Again, thank you and any other recommendations would be greatly appreciated. Those are all good choices! You should also try Lagavulin 16 some time. Cheers! Lagavulin 16, Caol Ila 12, Talisker 10. Talisker is my absolute favorite among the 3. To me it is almost total perfection. I love it! I go through a bottle in less than a week. I hope they never change or stop producing it. In a world where quality is constantly being degraded and and the finer things in life are being limited or denied us altogether in the name of “progress” or “fairness” or some other politicaly correct cause, or we are made to feel ashamed for liking certain things by the (liberal) establishment, this whiskey stands out and shouts ” ENJOY!!!”. Truly a great whiskey PERIOD. I hate to disappoint, but IAN FLEMING’s James Bond never drank, or even referenced, Talisker. I believe the only whisky named in the original Bond novels was Haig and Haig Pinchbottle (Live and Let Die). Talisker may have been referenced in the post-Fleming novels by John Gardner, but those (to my mind) don’t count. He drank a lot of bourbon, too, but I don’t believe any brands were mentioned. Really sorry. I hope this doesn’t somehow take the shine off of Talisker for you. Thanks for the correction, Oleg! I’ve updated the post. I still love Talisker. 😉 Cheers! Lo, for I must challenge this correction in it’s oversight of only covering the novels. Roger Moore and Pierce Brosnan have taken talisker neat on screen. A bottle has also been seen in M’s (Dame Judi Dench) office. 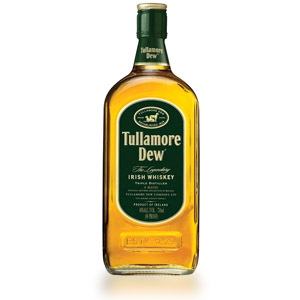 This is hands down my favorite whiskey. I will even go as far to say my favorite distillery. Having tried the 10yr, 18yr, Storm, and (through most fortuitous circumstances traveling abroad) Dark Storm, I must boldy say that Talisker can do no wrong! As far as your review goes my good man, top notch! The only thing I could add from personal experiences is there’s a certain medicinal quality, if you will, to the way this briny beast punches your palate! OK. I realy am a noob when it comes to single malts.Here is what I have tried so far: Glenlivete 12, Aberlour 12, Bowmore 12, Glenmorangie Quinta Ruban, Glenfiddih 18., Lafroig 10. 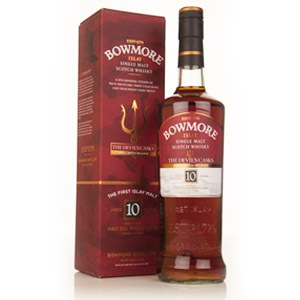 My favorite was (and stil is) Bowmore 12. And now Talisker 10. I bought it today, for 40$. Stil unopened. Reading all this, it must be realy special. Tommorow I’ll know…. Love the Talisker 10. Love Talisker in general. The distillers edition is fantastic. I plan on picking up the 18 for vacation. Can’t wait to try it. Great review! Thank you so much for this site- I’ve read through just about every review and tried a whole lot based on your recommendations. I must say that Talisker is like ambrosia to the gods, a very complex and great whisky. I love Laphroaig with its deep smoky favor, and although this isn’t as smoky, I do taste the peat and nice citrus flavor. Between Talisker and Laphroaig I may not buy anything else. I love how your flavor notes are very vivid and complex, and it always is a pleasant surprise to actually feel the same flavors. This is the first time I’m trying this, and I’m definitely getting the smooth oil and brine on the back of my tongue, and love the complex, earthy flavors unravel behind a solid, steady mild peat background. My favorite is still the Ardbegs, but this is still a very enjoyable, mind settling dram indeed. Talisker 10 is my favorite dram. All others pale by comparison, in my opinion. And that’s why it’s been so depressing for me to watch this venerable old distillery degenerate into a shameless cash grab by flooding the market with inferior NAS releases. Just got a bottle of Talisker 10 ($60) this week and tried it for the first time. Initially I was not impressed and was thinking it was similar to the current version of Lagavulin 16 (not a good thing). But after letting it open up for 20 minutes it got better (unlike the Lagavulin 16), and it’s got some complexity to it. Not heavily peaty on the nose it’s got a more subtle aroma than say an Ardbeg 10 which I’m a huge fan of. But if you let it sit in your mouth for a good 5 seconds theres all kinds of stuff going on. Theres smokeyness mixed with sweetness with a very satisfying long finish. I’m not an expert with articulating every flavor but there is definitley vanilla and ripe fruits and a hint of burnt carmel and toffee finish. 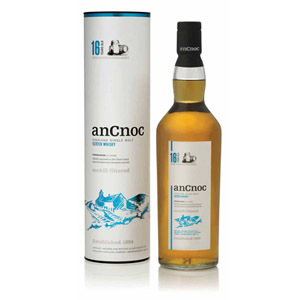 I like this malt but at $60 a bottle I wont be buying another one when Ardbeg 10 is $15 cheaper (although Ardbeg10 is a peat monster with a little different profile). I think the Talisker flavor profile is closer to Lagavulin 16 but the Talisker 10 is just better in every way across the spectrum. For a non “peat monster” that is under 46% abv and $60 or less this is my favorite. I agree with your impressions. I think of Talisker as the “complex” but not overly-peated of the island malts. I also find it a little better-balanced between sweetness and smoke than the Ardbegs, some of which are drier (the 10 and the new An Oa) and some are too sickly-sweet (newer Uigeadails for instance). There’s also a black pepper note that I find in Talisker, which I really enjoy. Cheers!